The main reason what I've been waiting that long was the lack of a decent camera. The Mavic 2 Pro, has a Hasselblad branded 1 inch CMOS 20Mpx sensor with a 28mm (full frame equivalent) lens. To my knowledge this is one of the first prosumer drones with a 1 inch sensor camera. On top of that, it has a variable aperture (f2.8/f11) lens, which is pretty rare as well in this market segment. Did you notice, I'm excited? Last week, I got my drone certificate in Dubai after a theoretical and practical test. As this is a legal requirement for flying a drone as a hobbyist in Dubai, I obviously want to follow the rules and lead by example. Since I'm a pilot myself, I'm a strong advocate for flying drones legally and responsibly! Anyway, back to the Pic(k) of the week. 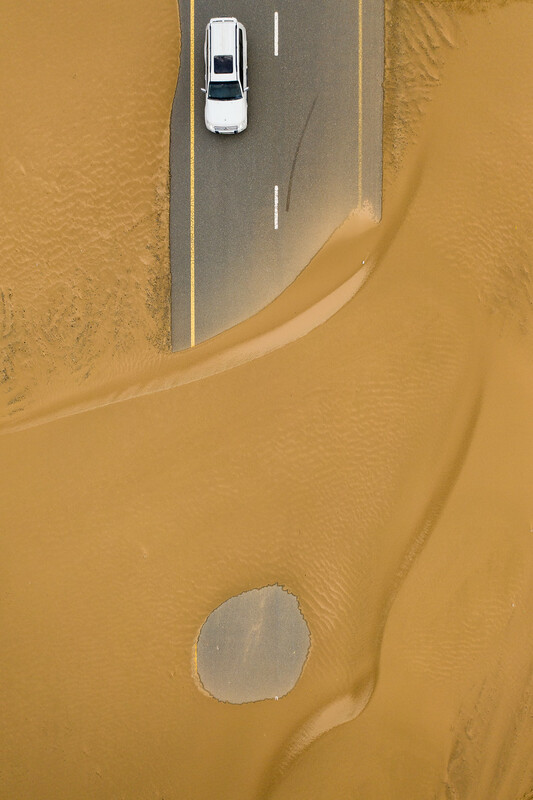 The image below was shot at an undisclosed location where there is a whole network of roads that have been overtaken by the surrounding desert. It was shot on an overcast day just after a rare period of rain, which makes the tire tracks stand out even more. In my Aerial photography, I've always been drawn to shooting straight down; something that is not that easy to do from a plane or helicopter but very straight forward from a drone. While I did shoot some images from ground level at the location, the results were mediocre. As photographers which should always be using the right camera for the right project! For the ones that want to see more, I've made a short 1 min video that shows the same location from a different perspective. Click here to check it out on Vimeo. Also check out my Aerial gallery for more images. No I haven't lost my desire to do "classic aerial photography" from actual aircraft and no, I haven't given up on shooting the great Fujifilm cameras! On the latter, please check out the worlds first X Summit held in Dubai on February 8. People attending the Gulf Photo Plus photo week (FEB 4-9) and that want to catch up, please leave me a message. Contact is in About page. "You haven't seen a tree, until you've seen its shadow from the sky" - Amelia Earhart.